The Springs in Fall / 2015 Photos #5: From the Mountains to the Prairies « Midlife Crisis Crossover! 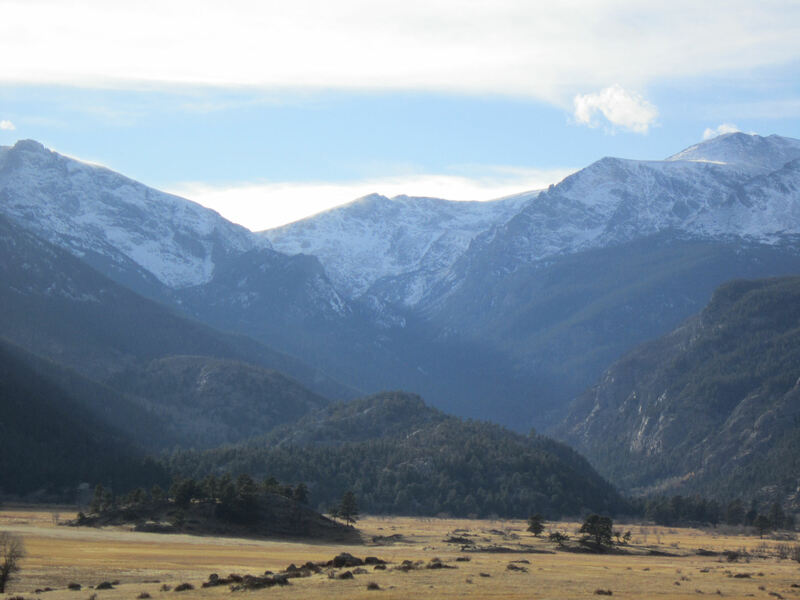 Last call for Rocky Mountain National Park photos! Eventually we had to leave Rocky Mountain National Park, and so we did. On our way out, we saw animals, picked up supplies, drove till after nightfall, and found a few things besides mountains to photograph. But mostly we wanted to hang on to the mountains for as long as we could. 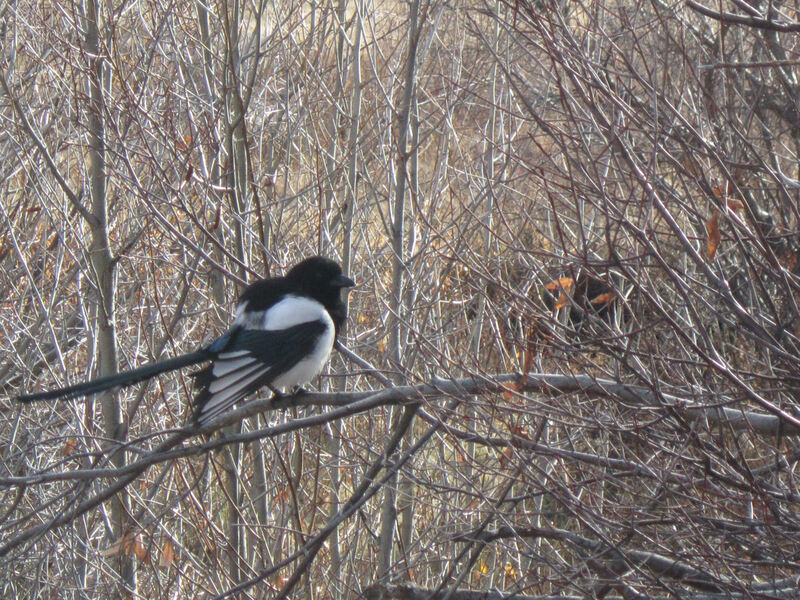 This black-billed magpie was the friendliest animal we met, perching right by us as if he just knew we’d reward him for showing up. Nice try, cute feathery panhandler. 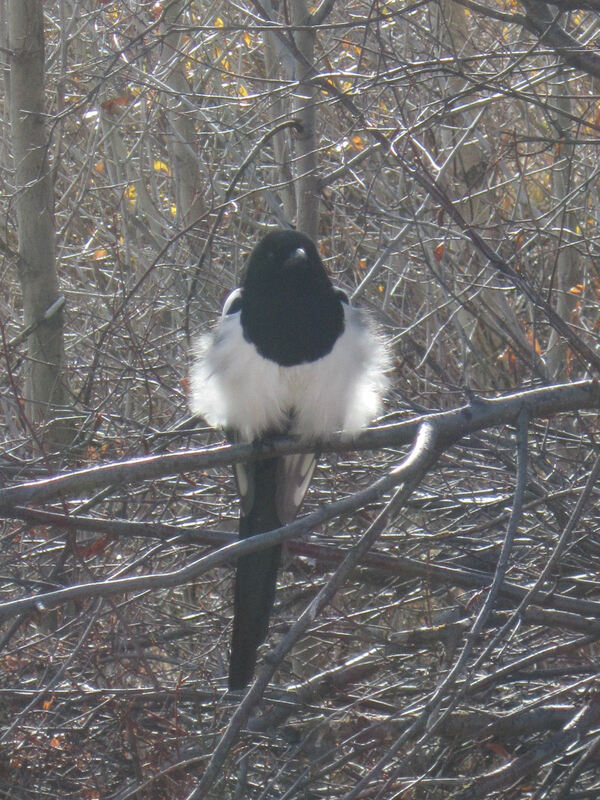 A second magpie likewise hung out curiously close to us at another point. Or maybe it was the same magpie, stalking us and waiting for an opportune moment to steal our car keys. 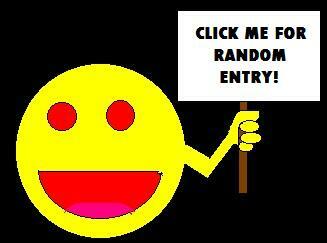 What dark thoughts percolate inside that impenetrable mind? The world may never know. 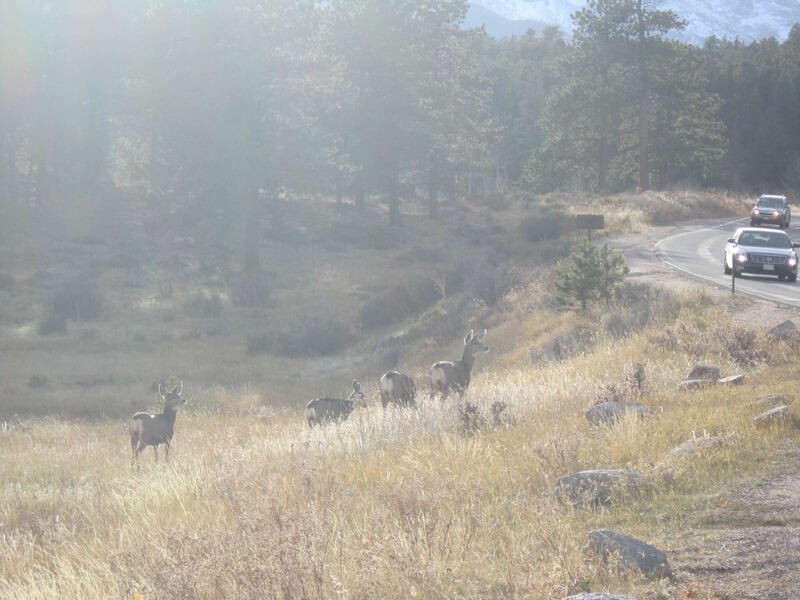 Once we retraced our ten-mile journey and returned to the park entrance, I braked hard so Anne could snap a shot of a frolicking deer herd. You’d think such gentle animals would be frightened of mankind’s fearsome machines, but there they are, all nonchalant and dismissive. Estes Park wildlife ain’t skeered easy. When it bothers to show up and show off for us humans, anyway. First stop at ground level was a mom-‘n’-pop grocery store to pick up a desperately needed 12-pack of water, their smallest bottle of aspirin, and a couple of gel-based toiletries to replace what we didn’t bother trying to bring on the plane. Soon as we got back to the car, I practically swallowed an entire bottle of water whole. Shopping for sundries never felt so good. 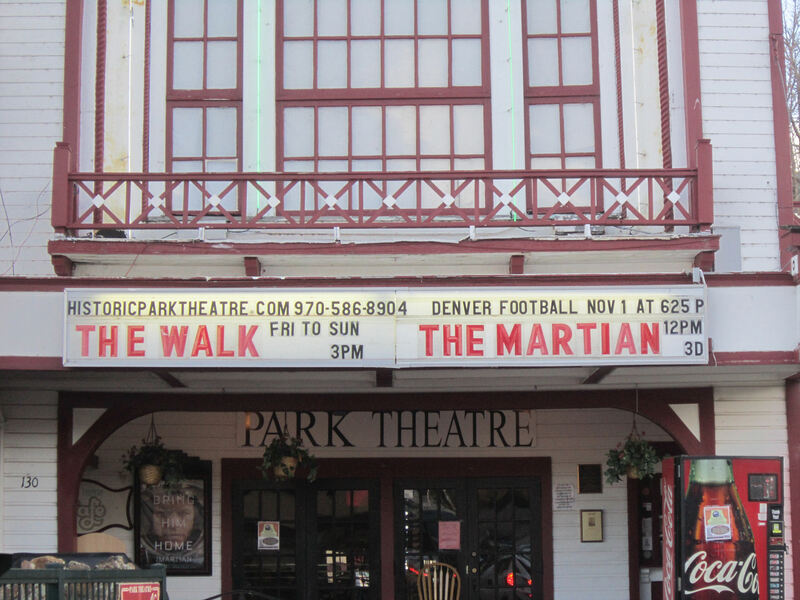 As we navigated the town one more time, I forced us to pause for a quick addition to my ever-growing collection of old-fashioned marquee photos, scattered throughout various past MCC entries that I need to consolidate someday. It’s just this weird sideline mini-hobby I have. Note to self: remember to see The Walk someday; try not to compare it constantly to Man on Wire. 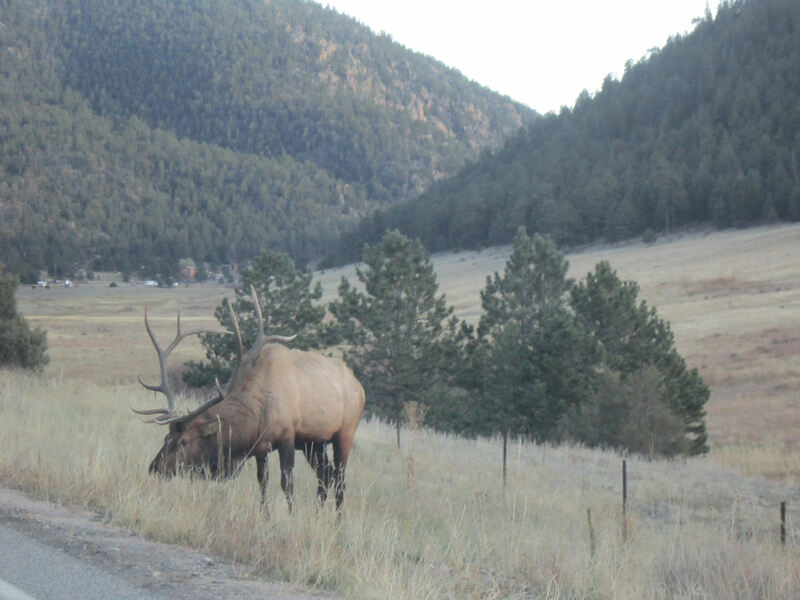 Last sight as we exited Estes Park for the year: giant elk! Three or four of us drivers had pulled over to the same side of the road to capture this big fella for our readers or social circles or scrapbooks or whatever. Good luck finding anything this size walking around an Indiana park. We thought it was a moose until a friend got all “Actually…” with us about the antler design. Sorry I don’t know some of these things, but my Ranger Rick subscription lapsed decades ago. 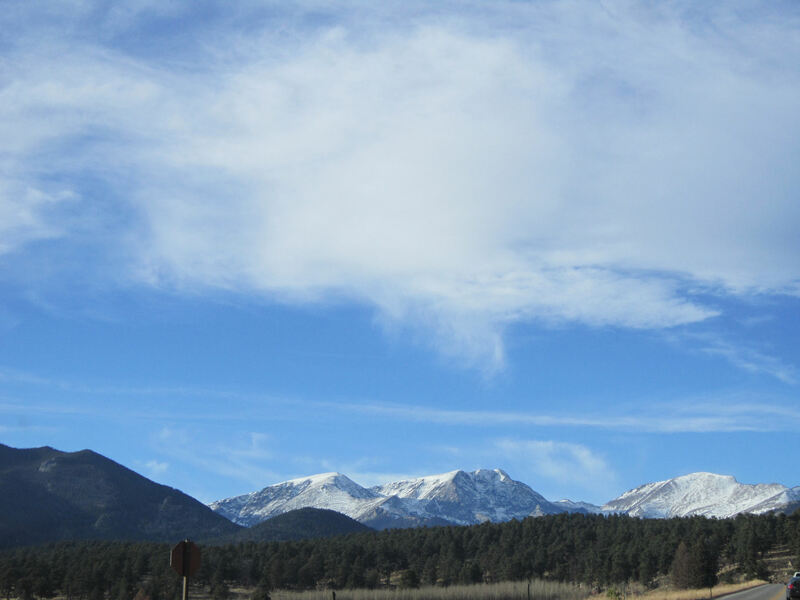 During the long drive from Estes Park south to Colorado Springs, the sun slowly abandoned us and slid behind the Rockies, its illumination downshifting through the spectrum, filtered through nature’s lingering signposts on the horizon. I’ve been dying to have my own “red skies” image for the MCC banner, and in 3½ years this is the closest we’ve gotten. For now it’ll do. 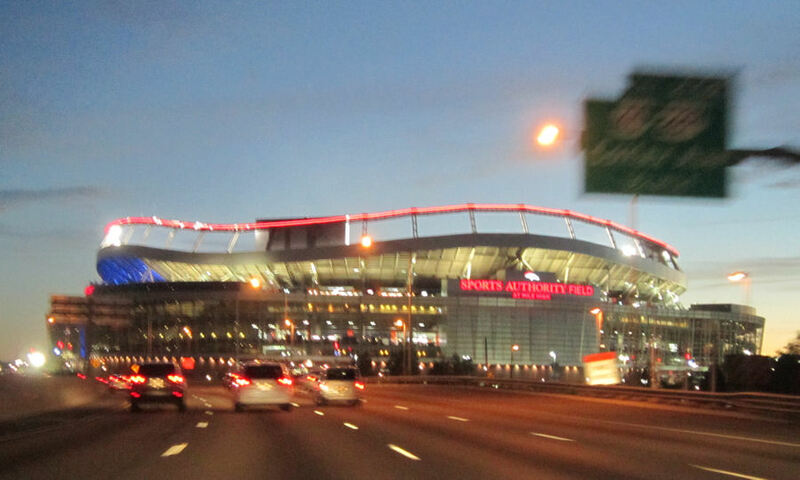 City lights sparkled around us as we drove the relatively flatland stretch of I-25 South through Denver, passing Sports Authority Field at Mile High, home of the Denver Broncos. For those who track such things: Broncos were indeed playing that night as we drove past, beating the Packers 29-10. I like to think we were their good luck charms. Nearly ten hours after we’d disembarked at Denver International Airport, we checked in at the Colorado Springs hotel where we’d be spending the next five nights. 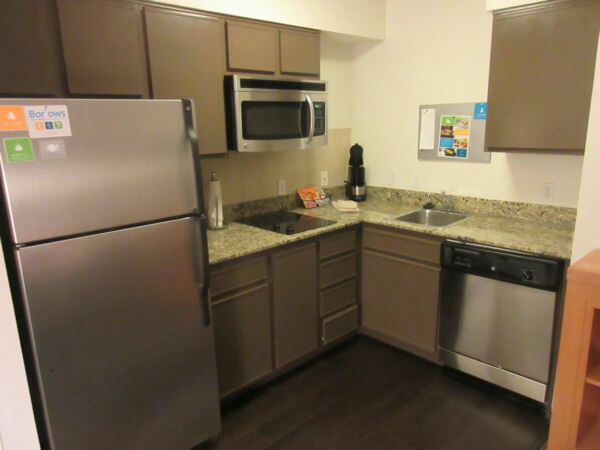 Our Hyatt Place room had the largest kitchen we’ve ever seen in a hotel. We’re not used to spending so many days in a single location and consequently had never tried “extended-stay” accommodations before. This was weird to us. Previous occupants left the fridge stocked with a half-gallon of not-expired milk, some butter, and a rejected box of breakfast Hot Pockets. Between our large lunch at Claire’s and the deleterious effects of our frequent elevation changes, Anne had no appetite the entire night. While she unpacked and tried to relax, I contented myself with a solo run to the nearest Smashburger for a Truffle Mushroom Swiss grilled chicken sandwich and rosemary/olive oil/garlic fries. Beyond that, we tried to settle in for the week ahead. She would be working full shifts every day, while I’d be living the life of a carefree gadabout, gallivanting around town, seeing the sights, trying new restaurants, taking pics of natural and man-made points of interest alike, and missing her companionship fiercely every single step of the way. …okay, let me console myself with just one more Rocky Mountain National Park shot, then I promise we move on to Day Two. For those just joining us: MOUNTAINS! They’re big and purty!